UFC President Dana White confirms that UFC heavyweight champion Daniel Cormier will receive his desired money fight against Brock Lesnar. 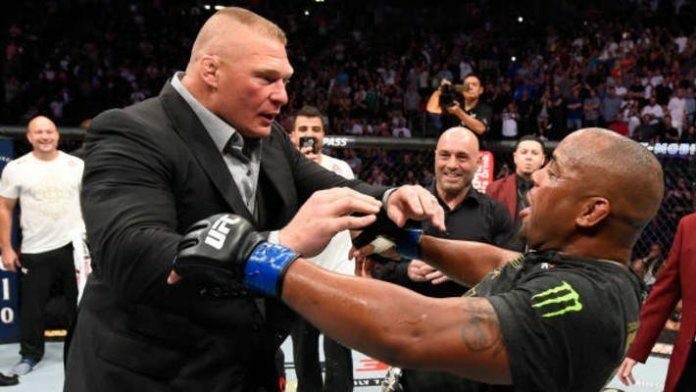 Last year, the UFC teased a big heavyweight title fight between Daniel Cormier and Brock Lesnar. Cormier had just knocked out Stipe Miocic – the most successful heavyweight champion in UFC history, to win the heavyweight throne. After the fight, Lesnar, who was cageside, entered the Octagon and confronted “DC”. The pair engaged in a shoving match before exchanging trash talk. This was in July. Since, Cormier has successfully defended his title once, and Lesnar has fulfilled his United States Anti-Doping Agency (USADA) suspension and is eligible to fight at any time. UFC President Dana White has been asked on numerous occasions what the status on Lesnar’s return to the UFC is. Every time the answer is the same – he’s waiting on Brock’s call. White said Lesnar is the type of fighter that will call him when he’s ready to fight, while also continuously reminding the media of Lesnar’s current WWE obligations. Over the weekend (Sat. March 2, 2019), Lesnar’s name came up with the UFC again. Following Jon Jones’ light heavyweight title defense over Anthony Smith, Jones was asked about a possible fight with “The Beast” down the road. Do you want to see Cormier and Lesnar fight in the UFC?